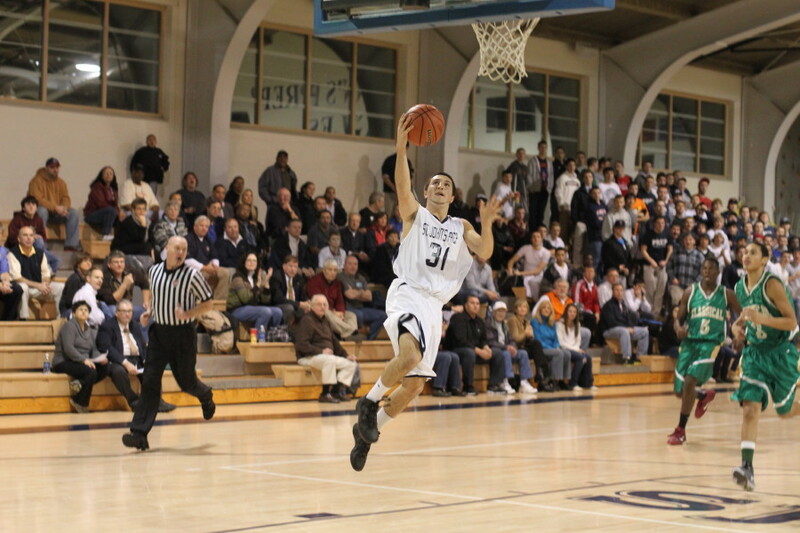 Mike Carbone gets the Eagles off to a fast start with a breakaway layup. Freddy Shove heads in for one of his thirteen points. (Danvers) The best player on the floor may have been Lynn Classical’s Uche Nwokeji but in a team game that isn’t usually enough as St. John’s Prep defeated the visiting Rams, 61-42, on Thursday night. 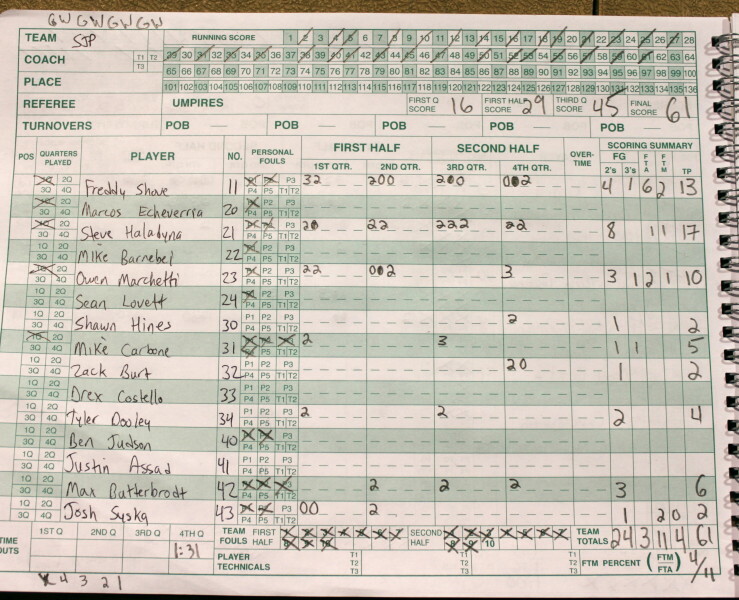 Uche dropped in a game-leading twenty points and all of them were from in close. 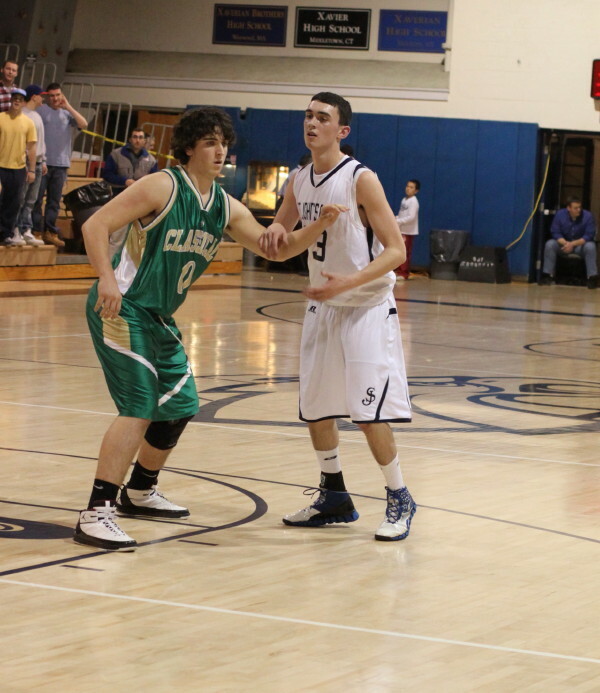 He rebounded well and played good defense with only one foul. 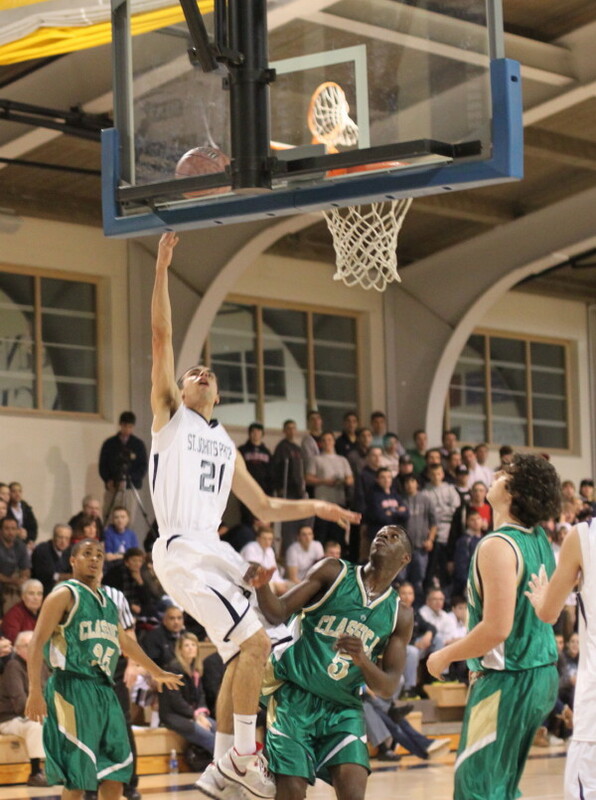 But he wasn’t enough on his own to challenge the defending Division 1 champs on this night. St. John’s is in the post-Pat (Connaughton) era and the biggest challenge will be replacing the Notre Dame freshman’s 20+ points per game. Steve Haladyna paced the Eagles with seventeen points but it took him a lot of shots to get that many against Lynn Classical. He had some pretty good looks. 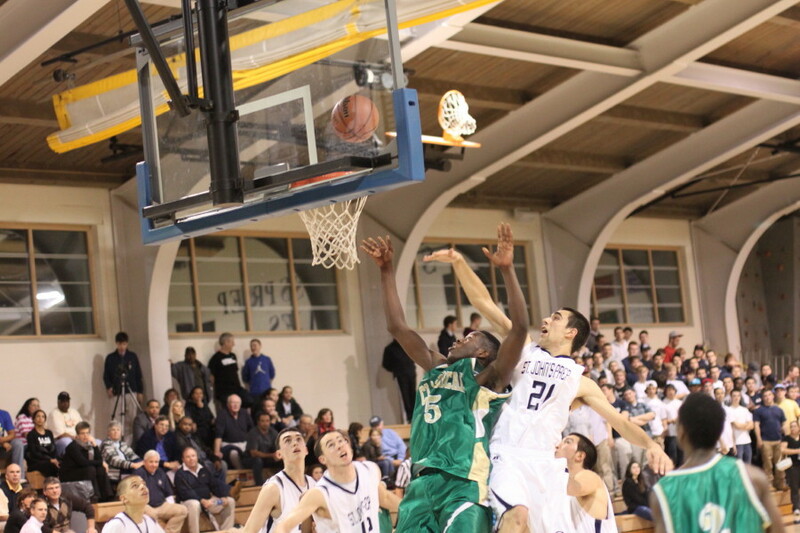 Uche Nwokeji (5) gets inside Steve Haladyna (21) for two. In my opinion, the key Eagle in this game was Freddy Shove. In a contest where finesse seemed lacking, he thrived with his aggressive approach on both ends. The lefty has enough of a 3-point shot to require outside attention and he definitely has the will to get to the rim if covered closely outside. Freddy tallied thirteen points. 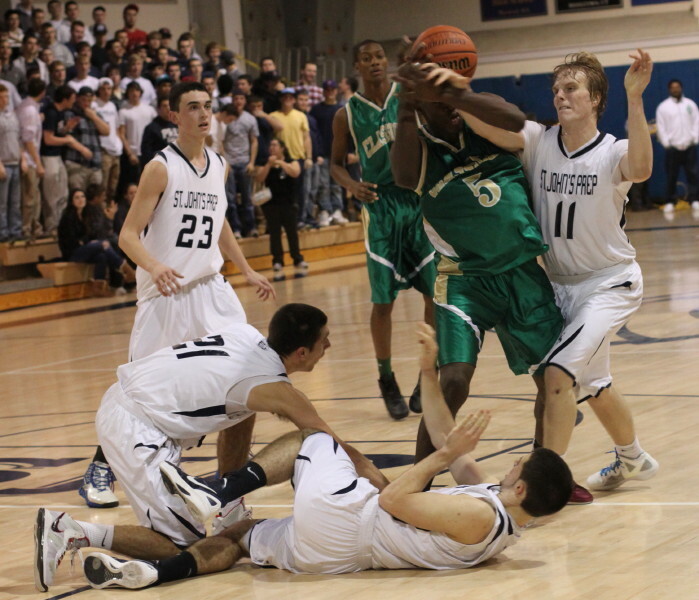 Pat may be gone but the Eagle’s defense is still the same – every inch of the floor is contested heavily. And that defense is going to win a lot of games. If the Rams had an offensive pattern I never saw it. 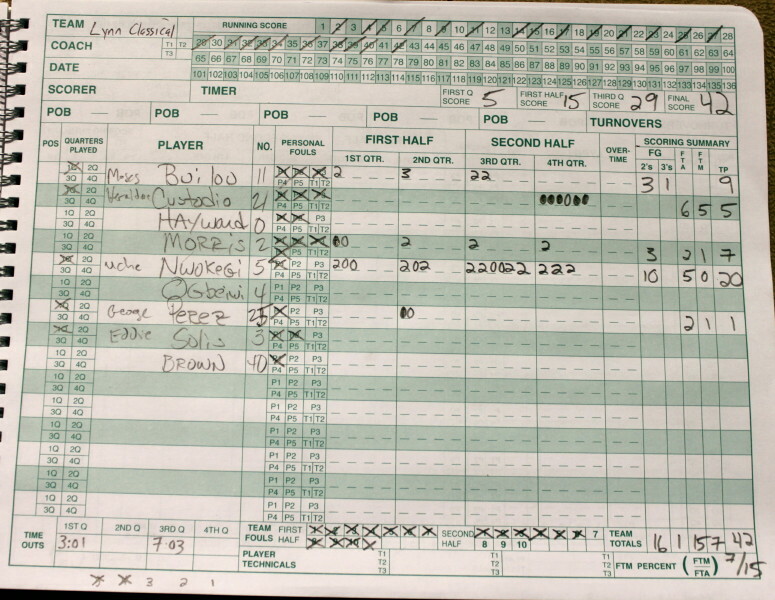 They were kept on the outside as the Eagles were determined that every pass was caught going away from the basket. It wasn’t much easier for St. John’s down the other end because of the raw athleticism of LC but the Eagles had slashers who could get to the rim on occasion. For LC it happened very infrequently. St. John’s (2-0) got the breakout they needed in the first period as a 5-4 advantage after three minutes turned into 16-5 by the end of the period. Freddy Shove had a trey and a layup. 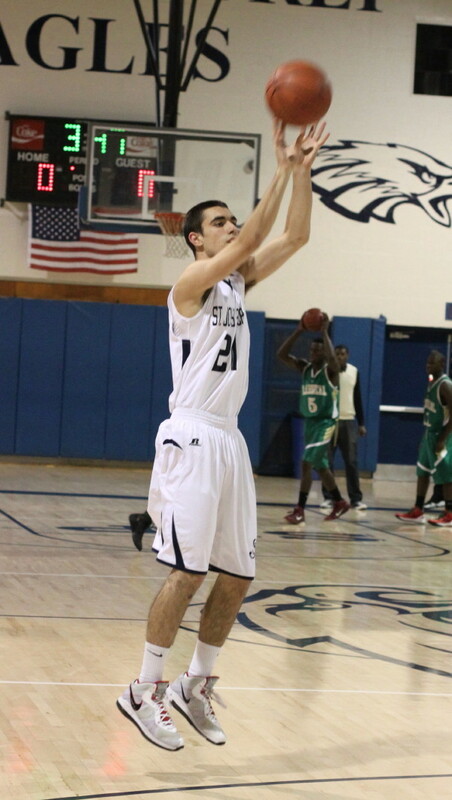 Steve Haladyna (21) gets two of his seventeen points just before halftime. The Rams (0-2) cut that deficit to 23-15 in the second period when Moise Builou (9 points) nailed a fall away long one with 3 ½ minutes to go until halftime. The rest of the half belonged to the Eagles. Steve Haladyna cashed in a couple of layups late and St. John’s was up 29-15 when the period ended. The Eagles’ scoring run continued to 33-15 before Uche led a Ram rally to 35-21. But back again came the St. John’s offense, this time with nine unanswered points, including a three by Mike Carbone, to get their biggest lead of the night – 43-21. LC was able to cut into the twenty-one point lead but never came close to putting an Eagle win in danger by getting with double-digits of them the rest of the way. 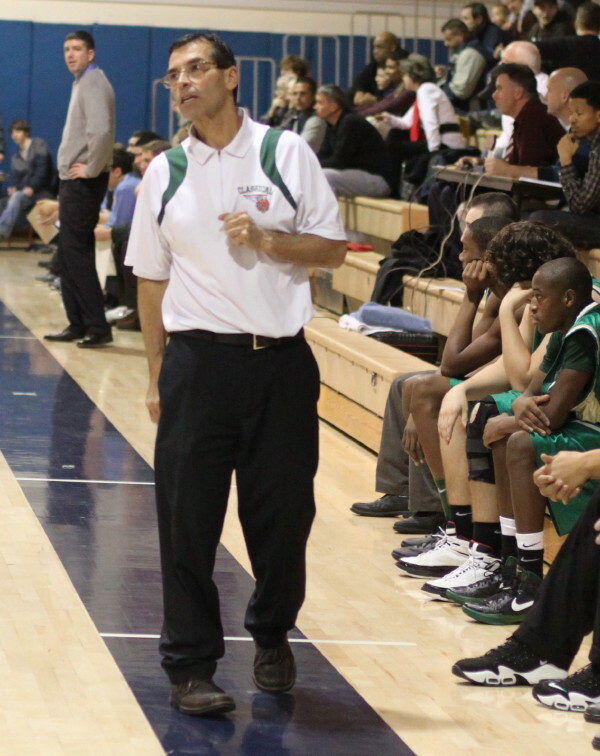 Lynn Classical coach Tom Grassa was forced to spend some game time mellowing out Ram spectators behind his bench. 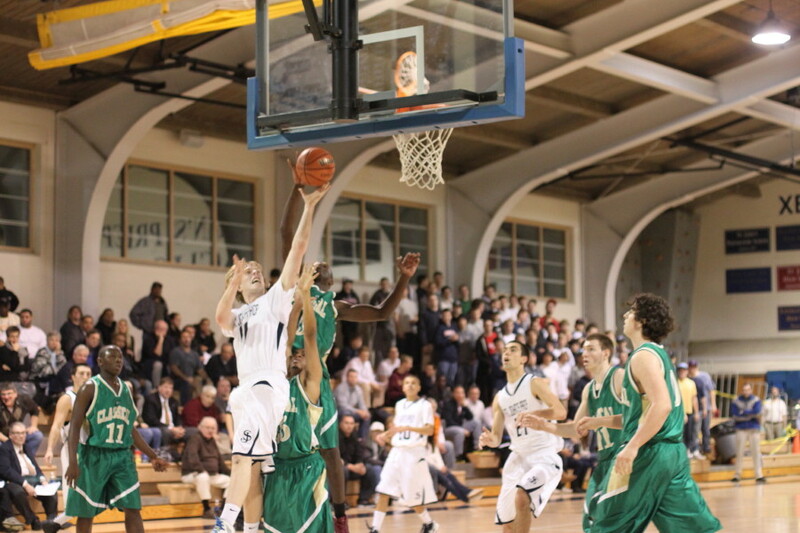 In a game with offensive fouls and skin-to-skin defense, there were calls that met with mixed reviews from both sides. The first thing I noticed upon arriving was the much lighter color to the gym floor. It had been sanded. My camera was never real happy with the combo of the white St. John’s uniforms and that very clean floor. Uche Nwokeji missed every free throw he attempted (five). At halftime he came out and practiced a couple more and missed those as well. Coach Tommy Doyle (Salem) was on hand to check out Lynn Classical. Tim Tebow: I love the guy! Let me start by saying I’m not a Denver Bronco fan. My loyalties are with the New England Patriots, with a side interest in the Dallas Cowboys. When the Patriots play the Broncos, I’m rooting for the Patriots. That’s not going to change. I will admit that my admiration for the young Denver quarterback gets stronger the more I read about him. He is a Christian believer and not ashamed of it. I doubt he’d be the guy quick-gazing around a restaurant before he bowed his head and prayed thanking God for his food. The 24-year-old has rapidly become a spiritual role model to many and for good reason……he practices what he says. Even as a senior on the Florida Gators he had folks thinking about him. Remember that Super Bowl ad that wasn’t allowed? My recall is that in the ad his pregnant mother explains that she was counseled to abort unborn Tim but refused. Good thing that ad was dropped. Wouldn’t you prefer ads about drinking etc.. instead of a “dangerous” ad about preserving unborn life? But I digress! Poor Tim couldn’t help but be pro-life. As he reasoned it, if his mother had taken the advice of doctors, after she became sick on a missions trip to the Philippines, she would have aborted him. Okay, I digressed some more! Another thing that I have liked about this guy is how he has handled the question of his life priorities. His listing order goes something like this: (1) pleasing God, (2) pleasing family, and (3) pleasing the Denver Broncos. There is no mention of the Denver Broncos in the Bible but the order of the first two is Biblical. We now live in a culture overrun with people, who if asked to present a similar priority list, might never find a place for God no matter how long the list was. When Tim puts God at the top, where He belongs, it offends the godless in our midst. As long as Tim was a benchwarmer in Denver, as he was early their struggling season, some could explain his lack of playing time with his confused priorities. Now that Denver has remarkably recovered winning seven of eight with Tim at quarterback, it has become very difficult to blame Tim’s priorities as being his downfall. So a currently successful Tim Tebow/Denver Broncos leaves the secularists on the sideline waiting for him/them to fall apart. My admiration for Tim Tebow is based on his trust in God and his willingness to go all-in as he lives out that faith in his high-profile life. If his future has him struggling on the field and/or off the field, he still belongs among us folks who love God and also strive to live out that faith in our world. I consider Tim Tebow a Christian brother of mine. We share a faith in which we recognize that God blesses us in so many ways. We also share a faith in which we know that our mistakes are ultimately relation-breakers with God and need to be righted with him and those involved. We also share a faith in which God promises to comfort His people in the struggling times. What a God we have, don’t we Tim! Go Pats!